A line of thunderstorms has developed in northern Ohio and western Michigan and is moving our way. 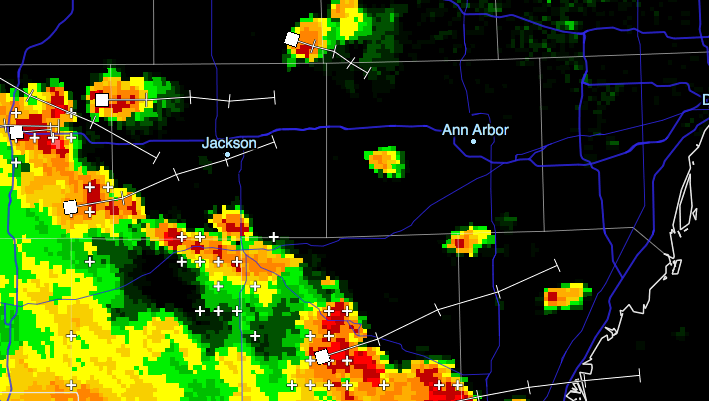 The line can be expected in Ann Arbor in roughly an hour; isolated storm cells may give us some rain before then. These storms are not currently severe, but they are expected to continue developing as they encounter the warm, humid air over southeast MI. Some cells in this line, particularly a strong one which will pass south of Ann Arbor, have produced strong winds, heavy rain, and small hail. Looking forward, thunderstorms are likely across extreme southeastern Michigan tonight through early Wednesday morning. It is difficult to predict exactly when (and if) storms will hit downtown Ann Arbor specifically. Heavy rain is expected with some storms across tonight. Warm and humid air across the area will fuel storm development tonight, and there is a slight risk of severe weather. Damaging wind is the most likely threat tonight, accompanied by the possibility of one inch hail. The strongest storms tonight, and therefore the worst wind and hail threats, are likely to be in extreme southern MI and northern OH, just missing Ann Arbor. But we can still expect some thunderstorms, with slight severe potential. Here’s a helpful afternoon briefing from NWS Detroit. THROUGH SUNRISE WEDNESDAY...AND OVER ALL OF SOUTHEAST MICHIGAN. WITH HEAVY RAINFALL. STORM MOTION WILL BE WEST TO EAST AT 40 MPH. FROM ABOUT MIDNIGHT THROUGH SUNRISE WEDNESDAY. Thunderstorm development is anticipated across southern lower Michigan this afternoon, as storms currently over Lake Michigan move east and encounter warm, unstable air over our state. Storms will move west to east at 30mph. Some of these storms are expected to be strong, with a chance of some storm cells becoming severe. It is difficult to predict exactly if/when strong storms will arrive specifically in Ann Arbor, but we can expect rain and thunderstorms between 2pm through the evening. With these storms, we have a 15% chance of damaging winds, and a 5% chance of large hail. Some storms will produce heavy rainfall. The tornado threat for today is minimal. SEVERE THUNDERSTORMS WITH 60 MPH WINDS AND 1 INCH HAIL ARE POSSIBLE THROUGH THIS EVENING. Looking forward to Tuesday, we can again expect afternoon thunderstorms, with a moderate risk of severe storms with damaging winds and large hail.